Extreame Savings Item! Free Shipping Included! Save 41% on the ASWCOWY Pinwheels Windmills Wind Spinners 3 Pack Made of Durable 100% Weatherproof Nylon and Fiberglass Children's Toys Outdoor Camping Kindergarten Garden Lawn Yard Decor (style2) by ASWCOWY at List It Fort Worth. Hurry! Limited time offer. Offer valid only while supplies last. Pinwheel 3 Pack Made of Durable 100% Weatherproof Nylon and Fiberglass | Rainbow Colored spinner for Gardens dance in the slightest of breezes. 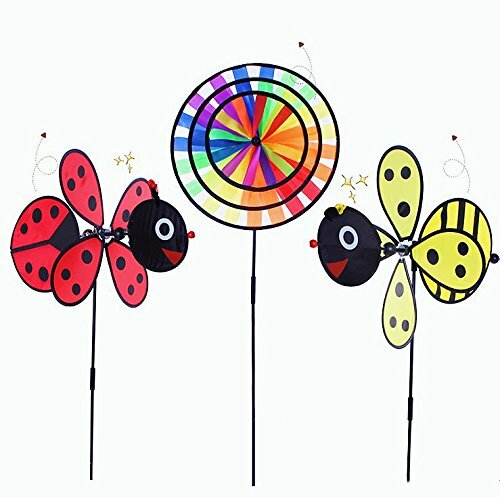 Pinwheel 3 Pack Made of Durable 100% Weatherproof Nylon and Fiberglass | Rainbow Colored spinner for Gardens dance in the slightest of breezes. "Material: Non-woven fabrics + PVC + Resin + Plasitc. The good materials and excellent technology make those colorful owl windmills more sturdy and durable and won`t fade easily. Bright colors, Easy to apply. Can be used for balcony viewing, Acailable for outdoor use. Eye catching, Wings easy to rotate, brings more attraction for your garden. it must be a beautiful scenery. As well as can be a good toy for children." Material: Non-woven fabrics + PVC + Resin + Plasitc. The good materials and excellent technology make those colorful owl windmills more sturdy and durable and won`t fade easily. Bright colors, Easy to apply. Can be used for balcony viewing, Acailable for outdoor use. Eye catching, Wings easy to rotate, brings more attraction for your garden. it must be a beautiful scenery. As well as can be a good toy for children. If you have any questions about this product by ASWCOWY, contact us by completing and submitting the form below. If you are looking for a specif part number, please include it with your message.